I love food. I love to eat. I've always picked up strange fascinations with certain dishes. The two primary obsessions, for which I've spent years on a quest seeking the perfect recipe, are Carbonara Sauce and Jambalaya (my favorite food is Cajun food). We'll stick with Carbonara Sauce for this post. There is nothing more perfect than the perfect Carbonara (and I am still searching). The best carbonara that I've ever had was at a restaurant in Rome. Sometimes the best dishes are ones that are very simple and straightforward. 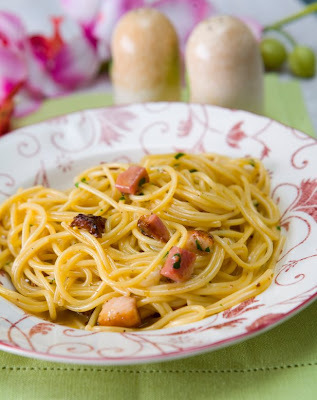 Carbonara is a perfect example: eggs, cream, butter, parmesan cheese, a little onion, parsley and bacon (pancetta). This is one of the most sinfully delicious meals ever. And, such beauty in a dish, no? For years, I have tasted this dish in restaurants and for years I've hunted for carbonara recipes in cookbooks (someday I'm going to publish a cookbook solely about carbonara). Most restaurants idea of carbonara differ quite a bit from my ideal. There seems to be two types of carbonara recipes. The first is a cream-based sauce similar to alfredo. The second, and my personal preference, is egg-based. Then there are recipes that combine both which as long as it's light on the cream are okay alternatives in my book. Sometimes you'll find restaurants or recipes that add either mushrooms or English peas in the carbonara. I tend to be a purist and prefer it without either. The best recipes for carbonara, in my opinion, have little cream, and you literally pour the raw eggs and bacon mixture over pasta and toss. Perfection! Exquisite! And relatively inexpensive to make. What I'd like to further explore is why there are two schools of thought about carbonara Sauce: cream-based versus egg-based. Is it a regional Italian preference? Where exactly did carbonara Sauce originate. Oh, and my personal pasta preference with Carbonara is spaghetti, but I've had it with every type of pasta and it's always perfect. Heat the olive oil and butter in a skillet over medium heat. Add the onion and cook, stirring occasionally, for 2-3 minutes, or until translucent. Add the garlic and bacon and cook until the bacon is crisp. Transfer to a warm dish or bowl. When ready to prepare return the bacon mixture to the skillet. *Combine the cream, eggs, and cheese in a large bowl and season to taste. Working very quickly, tip the spaghetti into the bacon mixture and pour over the eggs. Add the chopped parsley. Toss the spaghetti quickly until the egg and cream mixture, using 2 forks, and serve immediately. Garnish with fresh sage twigs and parmesan cheese. Cook's tip: the key to success with this recipe is not to overcook the egg. It is important to keep all the ingredients hot enough to just cook the egg and to work rapidly to avoid scrambling it. This recipe came from a book titled: Pasta Sauces: A classic collection of Italian-style recipes published by Parragon, 2004, page 24-25.